It brings me great sadness to report that founding member of the legendary Chicago based Soul group The Chi-Lites, Robert “Squirrel” Lester (pictured in white) has died. Squirrel performed with The Chi-Lites up until his death. He and Marshall Thompson were the only original members. 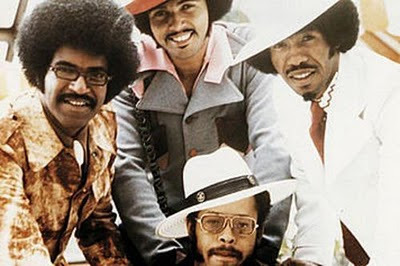 The Chi-Lites notable songs include the #1 Pop hit “Oh Girl” and R&B #1 hit “Have You Seen Her”. The Chi-Lites were inducted into the Vocal Group Hall of Fame in 2005. While never gaining the popularity as other Soul groups such as The Temptations, their legacy remains strong due to newer artist sampling their music. The Chi-Lites have been sampled by artists such as: Beyonce, Jay-Z, Mc Hammer, and Paul Wall. Personally as a fan and lifelong Chicagoan, Robert “Squirrel” Lester commitment to The Chi-Lites and to Soul Music as a whole is greatly appreciated and will be missed. Was he the lead singer? 'Oh Girl' is one of my favorite R&B songs from back in the day. He will be missed! No he was the second tenor. The lead singer was Eugene Records who passed in 2005.